The Gibson 1964 Reverse Firebord III was introduced in 1998 as a resissue of the reverse bodied Firebird from 1964. Relatively few examples of the original Firebird IIIs were made so these Gibson Custom Shop reissues are the best way to get your hands on some classic reverse-body styling. Tonally this model has powerful but bright mini-humbuckers with through-body neck construction contributing to sustain. 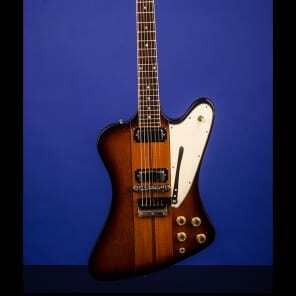 Take the GIBSON 1964 REVERSE FIREBIRD III (1998 reissue) price survey.